There are two basic types of orchids: monopodial and sympodial. 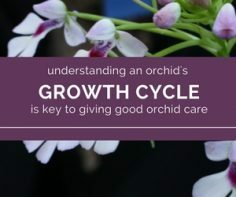 Understanding the differences will have a big impact on how you care for your orchid and what you can expect from your orchid in terms of FLOWERS. 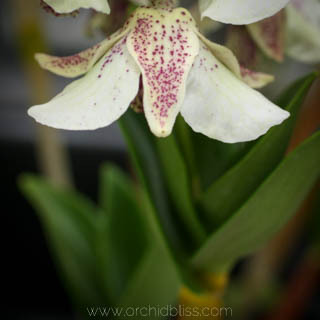 Monopodial and sympodial describes the growth pattern of different types of orchids. Growth pattern simply refers to the way the orchid grows. This includes everything from the root system to the leaves and flower stalks. The most common types of monopodial orchids include the Phalaenopsis and Vanda. These orchids grow off a central, vertical stem with leaves growing off each side. 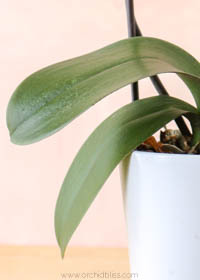 Each year your orchid should grow 1 or 2 more leaves. Watch for new flower spikes emerging 2 or 3 leaves down from the newest leaves. Even if your orchid is not currently in bloom, but it is growing leaves then smile because you know that these leaves signal future flowers. As your orchid matures you may eventually see a flower spike growing on either side of the central stem–at the same time! 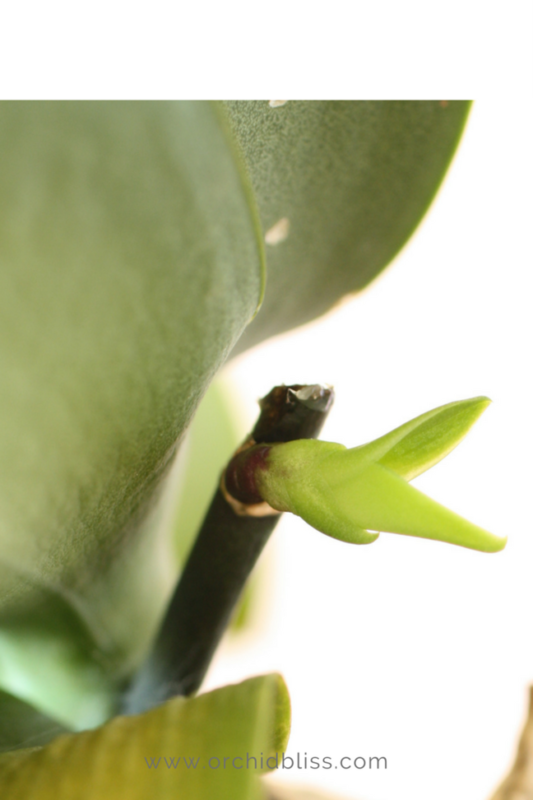 New flower stalks grow from a central flower stem on this mini phalaenopsis. The base of a monopodial orchid is an interesting place to keep an eye on. The base is where flower stalks and aerial roots emerge. And, it’s also the place where small nodes, develop keikis- or baby orchids. 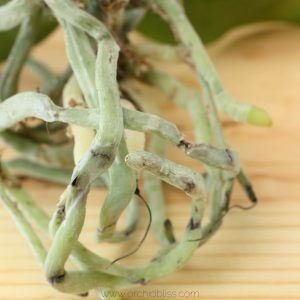 These types of keikis are called “basal keikis.” This type of keiki should not be separated from the mother plant because this type of keiki shares the same root system with the mother plant. This keiki is growing off of a clipped flower stalk. Soon it will develop its own roots. When the keiki’s roots are about 3 inches long the keiki can be separated from the parent plant. If the keiki were growing from the base of the orchid rather than a flower stalk I would leave it in place. 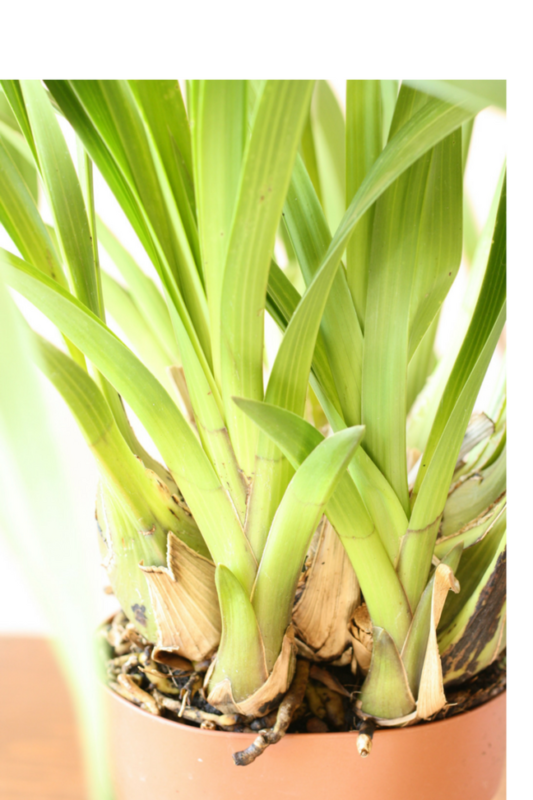 Unlike monopodial orchids that grow from a single stem, sympodial orchids have multiple stalks or more accurately, pseudobulbs, which increase in number every year. These orchids grow from a horizontal stem. Usually, these new pseudobulbs emerge from the side of an older pseudobulb. 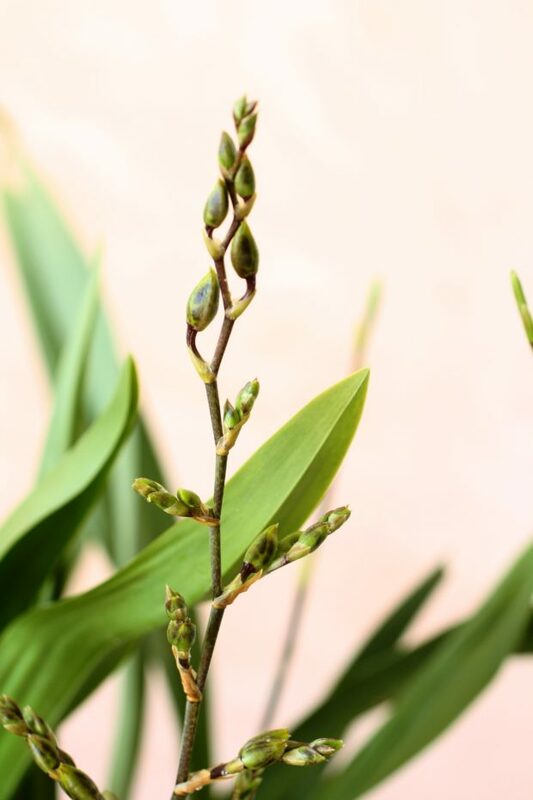 Once your sympodial orchid has finished flowering watch for the emergence of new pseudobulbs which should grow even larger than the older pseudobulb. 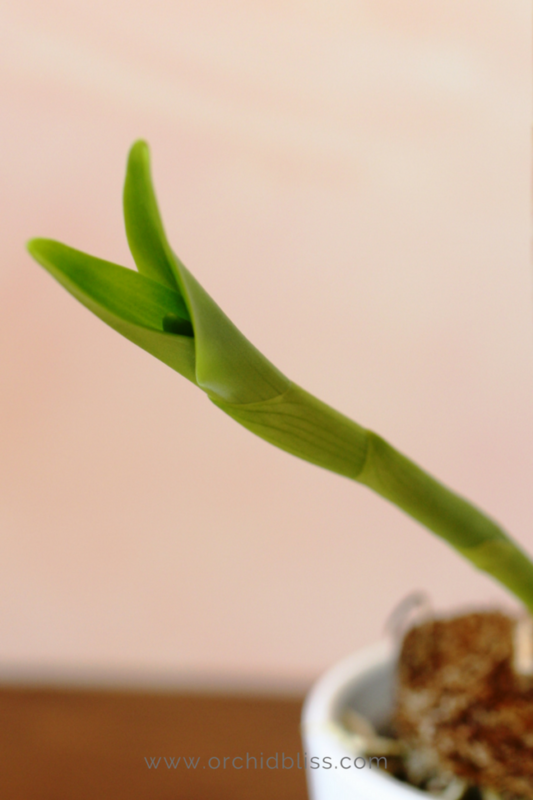 These new bigger pseudobulbs indicate where new flower stalks will grow. Pseudobulbs serve another purpose as well, water storage. 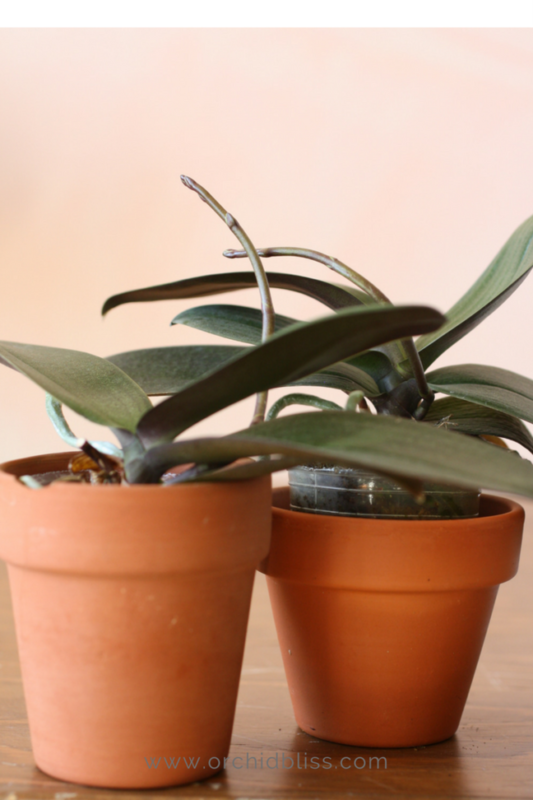 Try to keep your orchids’ pseudobulbs nice and plump, not withered and dry. New pseudobulbs emerge from the outside of an older pseudobulb. These new pseudobulbs will increase in size and flower stalks will soon begin to grow. Sympodial orchids usually flower once a year but can put on a real show when they do bloom because several flower stalks will shoot up at once, producing a profusion of flowers. Throughout the past year, I watched as new pseudobulbs grew and developed on this Oncidium. After a long wait, the flower stalks are loaded and ready to burst open with a fragrant abundance of blooms. Happy day! The new pseudobulb on this Dendrobium tells me that the high light requirements of this orchid are being met. Soon I will be rewarded with flowers. 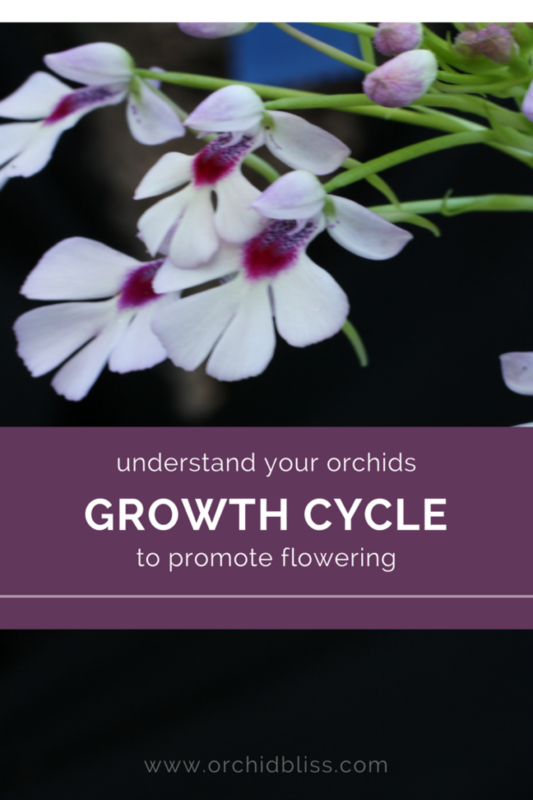 Now that you understand the growth pattern of your orchids, you’ll be that much better at caring for your orchids. The growth pattern tells you when to expect flowers, and when to expect root and leaf development. 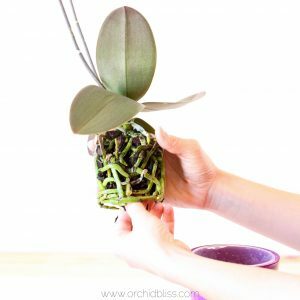 Pottting at the right time vastly improves how well your orchid will adapt. Very informative! And great pictures!! Very helpful. I’ll revisit soon. There’s a lot I need to learn. I’ts great hearing from you and I’m glad you’ll be back. I’m happy to answer any questions. If leaves have withered and died, can I cut them off? Yes you can certainly remove older, dying leaves. It is perfectly normal for the lower leaves on a Phalaenopis orchid to turn yellow, wither and die. 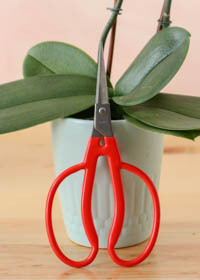 Be sure to sterilize your scissors with rubbing alcohol or with heat. I use a butane torch to sterilize my shears. I LOVE MY ORCHIDS AND AM ALWAYS GLAD TO SEE A NEW SPIKE, I AM NEW AT THIS AND ANY INFO YOU GIVE IS APPRECIATED . You’re welcome Laval! 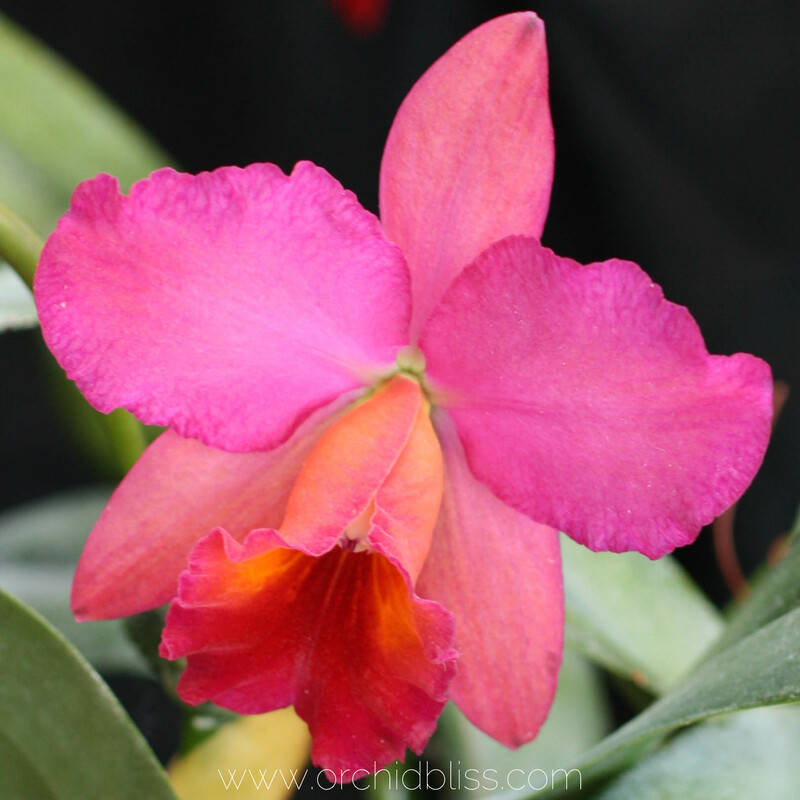 Don’t hesitate to reach out if you have a question about caring for your orchids. Thank you for the great pictures and information. This is very helpful to me as a beginner. However as I am in Australia some conditions may have to change. You have a good point. Growing conditions certainly depend on the environment. For instance, I’m in the middle of spring, while you’re enjoying fall. Thank you! 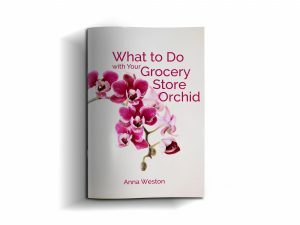 Let me know if I can help you with any problems you may encounter growing your orchids! My orchid is getting bigger. I want to re pot, though this is a first for me. Normally after my orchids are done blooming it dies. I have never been able to keep one alive, but was able to this time. I realized they don’t need much water at all . My orchid is planted in wood chips only. Can it be potted in soil or do I need to just get wood chips? First off, congratulations on keeping your orchid alive and on figuring out a good watering schedule! 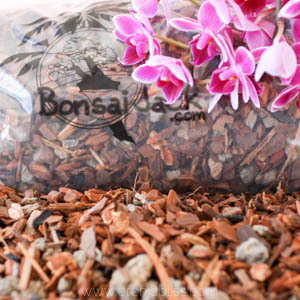 To repot your orchid, I recommend using a Douglas fir bark based potting medium. Here is a link for the potting medium I use and recommend. Also, if you purchase through this link, I receive a commission, at no additional cost to you. Should I cut the flower stem off after the flowers die off? I am new to taking care of orchids. I have 2 done flowering. Both 1 yr old with their stems intact. I did not cut off as they are still plump and healthy looking. You can cut the flower stem off after the last flower and there is about a 50% chance that more flowers will grow on the stalk. My recommendation is to cut the stalk off about an inch up from the base. 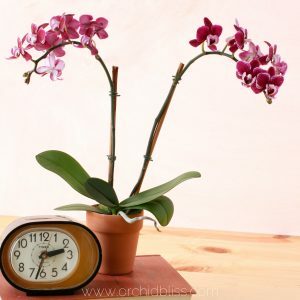 This will give the orchid time to rejuvenate and will, in the long run, produce larger, more abundant flowers.